These topics can be explored by small groups or individuals. These may lead you to think of more as you explore them. If you do, share them with us in the comments section at the bottom of this page. “When I was a kid I could tell the difference between neighborhood kids who wanted to be my friend from the neighborhood kids who were my friends so that they could play with my toys,” says Pastor Rick Henderson in the April 24, 2015 edition of Huffington Post Religion. (Link below.) That is the most common criticism of the prosperity gospel – that adherents want God’s things more than they want God. What do you think about the Prosperity Gospel? Is it drawing people to Christ in ways other theologies are not? Is it scriptural? Does it miss the mark in some way? Google the word “abundance” and you will find not Christ’s word in John 10:10 but book after book on how we can attract abundance to ourselves by changing our attitudes (or energy flow). On the upside, say the authors, this abundance can provide for every man, woman, and child on the planet. What do you think about this? Is it up to us to save ourselves and the world? Does God play any part in it? With our wet spring, South Texas is blooming. A drive along IH 35 or IH 10 is graced with an abundance of Texas wildflowers. If you want to be immersed in abundance, nature does not disappoint. Get out in it. The website Spirituality and Practice offers a 40-day e-course in Practicing Spirituality in Nature that was offered originally in 2009 but is still available. 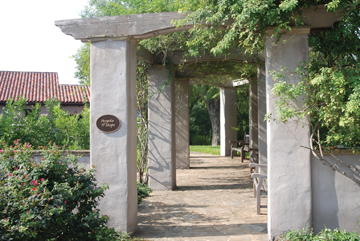 Or visit the Bishop Jones Center in San Antonio and take the Cathedral Park Meditation Walk. It is an eight-stop walk around the beautiful grounds of the Jones Center of guided meditations using downloadable audio recordings. Go to it at the link below. You will need a smart phone that connects to the Internet to access the files. Or just go sit in nature. Take the dog.